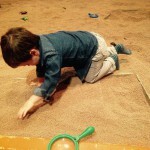 Readers of this blog will know that the Horniman Museum is our local and, as such, we are more than a little biased about how great it is. 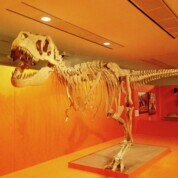 Nonetheless, it’s well-established that the Horniman really does know how to entertain families with young children and the latest exhibition, Dinosaurs: Monster Families, is no exception. Following last year’s Plantastic! 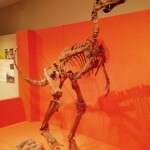 exhibition, the first thing that struck me was that Dinosaurs: Monster Families has fewer computer-based interactive exhibits and games and a greater focus on hands-on elements instead. 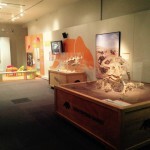 The exhibition explores the way dinosaurs looked after their eggs, nests and babies: there are lots of dinosaur skeletons, along with models of fossilized bones, eggs and nests. Children are encouraged to touch the eggs and to have a go at putting the fragments of a large model dinosaur bone back together. Children can grab a magnifying glass and explorer hat to get in the mood for a spot of palaeontology; and elsewhere there are dinosaur toys, books, puzzles, magnets, a colouring-in station and a dressing up box to get stuck into. Both my, admittedly somewhat dinosaur-obsessed, boys enjoyed what was on offer. We will no doubt be making many return trips between now and October when the exhibition closes. Dinosaurs: Monster Families is bound to be a hit with all those dino-loving little ones out there. Tickets cost £7 (adult), £4 (child over 3), £17 (family). Free for members. 10.30am to 5.30pm every day until 30 October 2016.